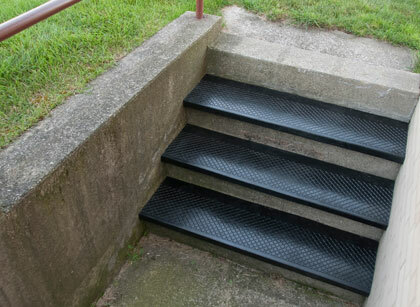 Our new Outdoor Recycled Rubber Stair Tread #633 is a perfect solution for exterior stair covering on a tighter budget than Aluminum Stair Treads allow. These rubber stair treads are made entirely from 100% recycled tires that would have otherwise sat in a landfill forever. They are made using a similar mold to our #622 square nose stair treads and #626 rubber stair treads, so you can match the pattern of your treads outside to inside as well. Due to the difficulties involved with dyeing recycled tire rubber though, these are only available in black, as shown to the right. 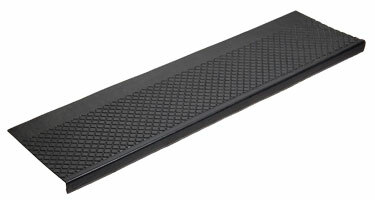 The Outdoor Recycled Rubber Stair Treads are the most durable rubber treads you'll find. They will hold up to anything nature can throw at it as long as it is properly installed. 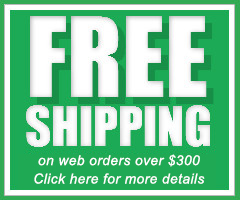 These are the only non-metal or wood stair treads that can be safely installed by screws. If you would prefer to glue it down though, please feel free to contact our customer service department for adhesive recommendations.